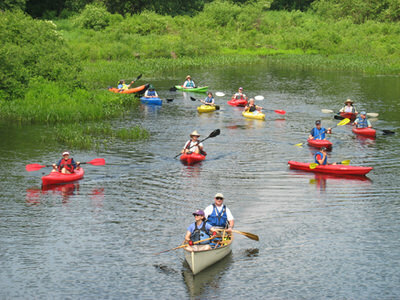 The Willimantic River Water Trail provides 22.5 contiguous miles of paddling enjoyment and challenges between Stafford Springs and Willimantic, Connecticut with only one short portage. There are three major segments: the rapids & quickwater of the narrow upper section, the flatwater impoundment above Eagleville Lake Dam and the moderate current and flatwater down to the takeout at the Airline Trail Landing and Launch just above the falls in Willimantic. The river is within an hour's drive of three of New England's largest urban regions. Many of the segments provide an opportunity for family-friendly, close-to-home outdoor adventures with a surprisingly remote feel; wildlife is abundant and the only traces of civilization are the remnants of old mills. Location: The trail begins in Stafford CT, just south of the downtown on Route 32. It continues parallel to Route 32 with launches and landings in Tolland, Willington, Coventry, Mansfield, Columbia and Willimantic (Windham) CT. 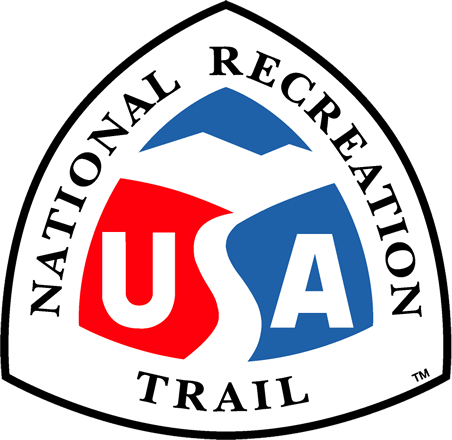 The water trail is accessible from two major east west highways - Interstate 84 and US Route 6 - via CT Route 32 which parallels the river. See the attached Paddle Guide and Stewardship Plans for detailed directions to individual segments. The Willimantic River Water Trail provides more than 22.5 contiguous miles of paddling enjoyment and challenges between Stafford Springs and Willimantic, Connecticut with only one short portage. There are three major segments: the rapids & quickwater of the narrow upper section, the flatwater impoundment above Eagleville Lake Dam and the moderate current and flatwater down to the takeout at the Airline Trail Landing and Launch just above the falls in Willimantic. NOTE: Do not pass downstream of the Airline Trail Landing and Launch takeout as there are dangerous falls below. 1. Stafford to Mansfield CT (13.7 miles of narrow rapids and quickwater suitable for experienced paddlers). 2. Mansfield River Park to Eagleville Dam in Mansfield and Coventry CT (1.4 miles of flatwater suitable for novice paddlers and families). 3. Eagleville Dam to Willimantic CT (7.4 miles of quickwater and flatwater suitable for paddlers with some experience). It's critical not to miss the Willimantic take-out as there are dangerous falls just downstream! The river is within an hour's drive of three of New England's largest urban regions. Many of the segments provide an opportunity for family-friendly, close-to-home outdoor adventures with a surprisingly remote feel; wildlife is abundant and the only traces of civilization are the remnants of old mills. The Willimantic River Water Trail flows through The Last Green Valley National Heritage Corridor known as a relatively undeveloped rural enclave in the midst of the most urbanized region in the nation. The Last Green Valley is 77% forest and farmland, and appears distinctively dark at night when viewed from satellites or aircraft. The Willimantic River flows into the Shetucket River, which eventually combines with the Quinebaug River to become the Thames River, creating the third largest watershed emptying into Long Island Sound. The Last Green Valley, Inc. partners with the Willimantic River Alliance, federal and state agencies, non-profits, riverside towns, and paddlers to promote enjoyment and stewardship of the Quinebaug, Willimantic, and Shetucket Rivers. An active Water Trails Steering Committee has developed stewardship plans and paddlers guides, made launch site improvements and hosted public events to raise awareness and increase recreational use.